Regular readers who might have identified my politics, such as they are, as being of the liberal and moderate left, may be surprised to learn that I was once a card-carrying Red. Ok, a card-carrying Junior Red. Or, to be a little more accurate, a birthday-card receiving Junior Red, with said card signed by my ‘favourite player’**. It was 1986, Falco were riding high in the charts with the first of their many, many hits; Chernobyl had spat out a distinctly “mmm, bit apocalyptic over Bill’s mums” looking cloud over Scandinavia; and Diego Maradona was about to give the English a cheeky one off the wrist. I was eight years old and just discovering the wonders of football for the first time. Prior to that, it had all been about beer and women. Either way I was pliable. With his own son not yet two, my uncle spotted an opportunity to mould me in his own image. If I did it right, eat my greens and all that game, I could grow up to be a big, strong Charlton Athletic fan. Thus I was enrolled, and became a Junior Red. Better than being a Junior Addick I suppose, Charlton having had several nicknames over the years. Junior Valiant wouldn’t have been so bad, but not strictly accurate at that time, what with the Valley being more house of weeds than theatre of dreams in the mid-80s. As such the first football match I ever attended was at Selhurst Park, with Charlton hosting Liverpool, the then league champions. It finished 0-0, setting me up nicely for a lifetime of disappointing football. With a club at its lowest ebb off the field and no ground of its own, it’s perhaps not surprising I didn’t take to it. The club being based about seventy miles from one’s house could also be described as a bit of a sticking point for an eight year old. It’s probably just as well it didn’t really happen for me and the Charltons as my uncle eventually grew disillusioned with it all himself, and now watches Dartford, VCD Athletic and Kentish football in general. 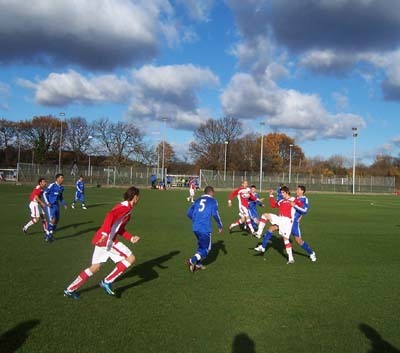 Still, however brief it was, my year as a Junior Red was my first football affiliation. After that I was a Junior Saint, then a Saint, all too briefly a human, then a Hawk. 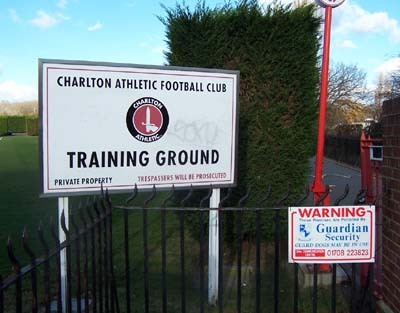 Charlton’s training ground, situated right next to Millwall’s, is an unassuming place with three pitches and a small pavilion in which the home side get changed. The away side however are stationed elsewhere. I imagine young players signing up for Chelsea daydream more about the money, the glamour, the women and less about having to get dressed in a Portakabin. Not that their development isn’t well looked after, being educated and trained under the auspices of one of world football’s biggest clubs. 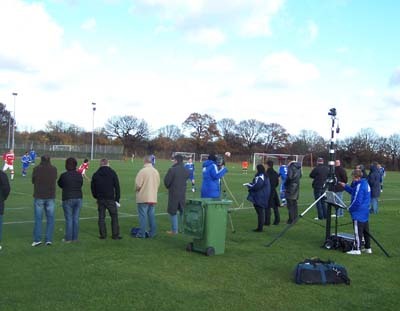 On the touchline, they have a professional camera recording the action, possibly for Chelsea TV, while behind that is a bloke cranking up the pole on a further periscopic tripod camera. I’m guessing, given it was attached to a lap-top, that this was something to do with ProZone, but you don’t tend to expect such whizzy e-technologies to require someone to have to wind anything up, particularly when they’re clack-clacking like a 1920’s car enthusiast trying to get the motor running on his Model A Ford. There was no discernable gulf in class early on in the game, and Charlton even took an early lead in the seventh minute courtesy of striker, and celebrated fish wrangler, Tamer Tuna, who capitalised on Jeffrey Bruma’s slip to steal in and slot past keeper Niclas Heimann. This caused Chelsea to up their game and fifteen minutes later they had their equaliser, Jacobo Sala curling in a handsome free-kick that keeper Harry Lee tipped onto the bar. Unfortunately for him, Jacob Mellis followed up to finish whilst Lee was still cascading to the floor. 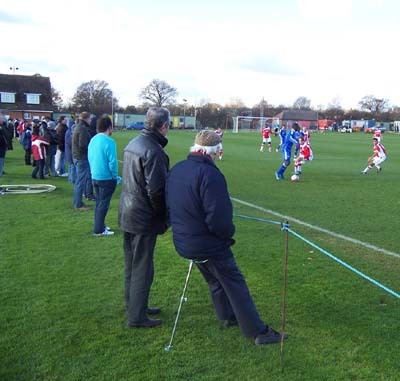 Looking over my shoulder briefly, I noticed that two pitches over, another Charlton/Chelsea youth game was taking place, I assume for a younger age-group but, confused momentarily by the small vs. far away issue, it could well have been a burp of parallel reality caught in a pocket of time. Mmm, think I may have watched too much Red Dwarf in my teens. And Father Ted. Meanwhile, back in the real world, the definitely real world anyway, Chelsea took the lead on the stroke of half-time, Fabio Burini getting behind the Charlton back four and crashing into the roof of the net before getting his hair ruffled by virtually all of his outfield team-mates, who all clearly believe it to still be the 50’s. On returning from the tea-bar in the car-park for the second half, I absent-mindedly took a short cut across the middle pitch. To my right I heard some commotion and looked to see what it was but couldn’t discern. After about three shouts it was becoming clear that it was “get off the pitch”. However I looked to my left and their appeared to be others crossing the turf who weren’t moving so I assumed a random kid or parent had wandered into the confines of the under-14’s game. Once I’d made it across, as people were being shooed more directly off the middle pitch, it became clear that the shout had been directed at me. Naturally, I was quite embarrassed, suddenly realising, whoops, that probably wasn't good form was it? At this point I turned around to see a guy in a Charlton jacket marching in my direction. He came up and seethed “I asked you three times. Don’t ignore me, and don’t walk on the pitch.” I defended myself on the ignorance issue but he was having none of it, turning on his heel with a sniff and steaming straight back to the under-14’s game. Across the middle pitch. The very same pitch he had traversed to administer the bollocking. Anyhow, live and learn eh? Although the Valiant Youth didn’t seem to, going further behind within five minutes of the restart. Frank Nouble curled in a shot, Lee palming it down at full stretch but only onto the boot of Sala, the ball crawling into the corner of the net like a dawdling john. Nouble was quite the hefty presence all game, being taller and more developed than his peers. Charlton, similarly, had a single grew-a-beard-at-12 colossus in their line up, in their case Yado Mambo, or 'Hey!' as he is known to the Rosemary Clooney fans in his social group. Taking a panoramic view of the action, both Mambo and Nouble were crashing about like baby rhinos in a kitten parade. Nouble was involved in Chelsea’s fourth goal as well, clattering through the frozen Charlton mob before eventually getting blocked. The ball span out to Daniel Philliskirk who hit a long-range shot off the top of his boot that curled out of Lee’s reach and into the far corner. Charlton, though, did not collapse and pulled one back six minutes later, as Chris Solly, ‘Meso’ to the more casually racist of his friends, broke effortlessly through Chelsea’s otherwise firm defence, piercing Heimann’s resistance with prodigious maturity. However, 4-2 it finished and I made my way out of the ground via only the most unhallowed of turf. 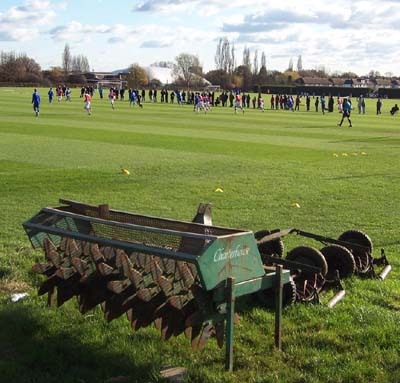 Still, I imagine, with a 5-2 home defeat and Alan Pardew’s sacking occurring for Charlton’s senior side later that afternoon, straightening the blades of grass I tilted beneath my tread will have given the Sparrows Lane ground staff summin' to do to take their minds of it all. Thus I am a hero. **Mark Aizelwood? Jim Melrose? Peter Shirtliff? Bob Bolder? I can’t remember exactly, but I imagine I wouldn’t have liked to play favourites. Mainly cos at the point of conscription, I wouldn’t have known a Charlton player if they’d booted me in my middle-school mush.